Defending Fairborn Classic champion Paul McCordic of Sugar Land, Texas uses a little body English to help with a strike during Friday’s July 13 Adult Pro Am event at Bowl 10 lanes in Fairborn. PBA50 Tour regular Tony Johnson of Canton follows through on a converted spare during the Fairborn Classic Pro Am event, July 13 at Bowl 10 lanes in Fairborn. 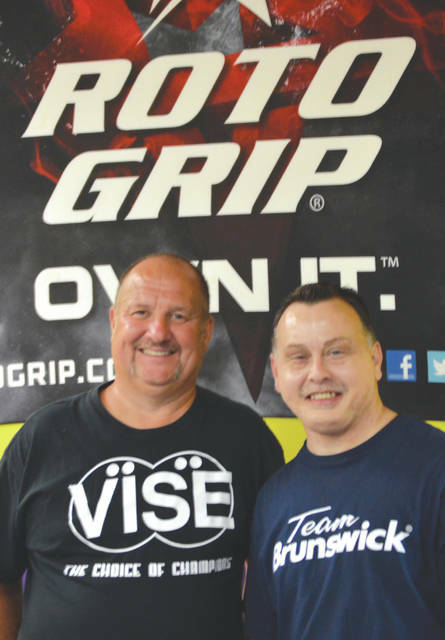 PBA50 Tour standouts Brian Kretzer (left) of Dayton, and Ryan Shafer, of Horseheads, N.Y. will be among the heavyweights vying for a qualifying spot in the Fairborn Classic, presented by Rotogrip, Saturday July 14 at Bowl 10 in Fairborn. Two qualifying rounds, one at 10 a.m. and another at 4 p.m., will determine the final 16 bowlers who will then compete for the Fairborn Classic title on Sunday July 15. 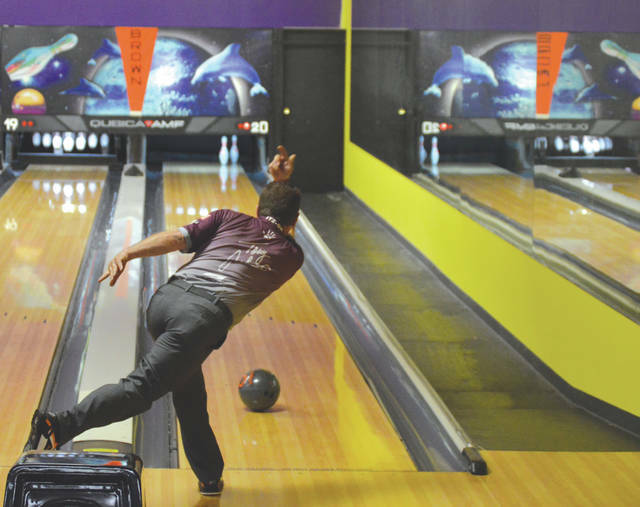 FAIRBORN — He could’ve stayed home for a rare weekend away from competitive bowling, but instead Ryan Shafer made the 401-mile trip from his home in Horseheads, N.Y. to Fairborn, Ohio for this week’s PBA50 Fairborn Classic, presented by Rotogrip. Dayton pro bowler Kretzer rounded up the bowling field and came up with a bowler friendly tournament format; then Bowl 10 proprietor Dave Flemming rounded up the tournament sponsors, teamed with Wright-Patterson Air Force Base to come up with a beautiful tournament trophy, and provided a first-class bowling establishment for the tourney itself. Shafer has won more than 30 regional bowling titles, and five national events. He’s recorded two perfect 300 games in televised matches. A three-time East Region Player of the Year, he knows his bowling tournaments. And he prefers a tournament format where a bowler’s scores throughout the tournament are counted toward the championship outcome, not one where the slate is wiped clean for each of the tournament’s final rounds. Shafer says he participates in around a dozen regional PBA50 Tour events, plus the national events. Kretzer, who has quite the bowling resume of his own, has teamed up with Bowl 10 proprietor Dave Flemming to create a tour stop that is along the way for several of the nation’s top senior tour bowlers before the next big major national event — the PBA50 River City Extreme Open, presented by Ebonite — set for July 14-17 in Monticello, Minn. The Dayton bowler has won tournaments in Europe, Asia and North America. He won the 2009-‘10 GoRVing Match Play Championship in Norwich, Conn. on the PBA Tour. He has amateur titles in the United Arab Emirates Open, and two wins in the $100,000 International Eliminator tournament in Las Vegas, and was named the 1999 Amateur Bowler of the Year by Bowlers Journal. With the Fairborn event serving as a nice stop off point for Shafer and other quality bowlers headed to Minnesota, many of the nation’s top senior bowlers are at Bowl 10 this weekend. Current PBA50 Tour money leader, Michael Haugen Jr. of Phoenix was bowling with locals in Friday night’s Pro-Am event, as was defending champion Paul McCordic of Sugar Land, Texas. 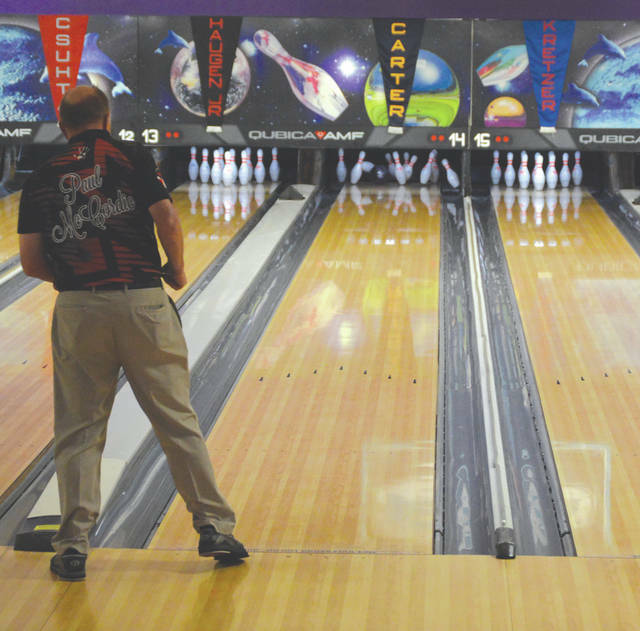 Bowlers from Alabama, Arizona, Florida, Illinois, Michigan, New York, Ohio, Pennsylvania, Tennessee and West Virginia will be in the Fairborn Classic tournament. Shafer says the level of competition is definitely high. “People think of the PBA50 Tour and they automatically think, ‘Oh, it’s all old guys.’ But you look around and it’s all PBA Hall of Famers. They can still bowl. That’s why a win in this tour is so hard to come by. Everybody is good,” he said. Kretzer worked out his unique format for the Fairborn Classic after seeing too many events where a bowler has a solid first couple days of the tournament, then loses by a pin to a competitor he’d defeated by 30 just a few days before. “That’s always good to know,” Shafer added. Kretzer said Ryan has been on the opposite end of the result, where he’d had his solid points slate wiped clean for a final round only to lose out to someone he’d beaten in an earlier round. “So now, on Sunday, Ryan will be able to appreciate why he finished second to me,” Kretzer said with a chuckle. The accomplished pros wanted to make sure to thank the tournament’s three local sponsors — Fayette Drywall Inc. of Dayton; S.A.R. Manufacturing of Dayton; and Fairborn’s Cherp Home Inspections. Saturday will have two qualifying rounds of bowling — one at 10 a.m. and another at 4 p.m. — to determine the top 16 bowlers who will compete in Sunday’s 10 a.m. tournament finals. Admission is free each day. Like they did after last year’s inaugural event, event organizers will donate some of the proceeds from the Fairborn Classic to help benefit high school bowling programs in the area. Contact John Bombatch at 937-372-4444, Ext. 2123. For information on the Fairborn Classic PBA50 Tour bowling tournament, call 937-878-9521.